The Campbell school community has identified four core values . 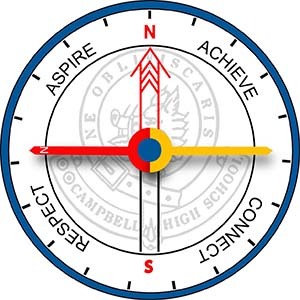 The “Compass” model is relevant to all levels of our school community: student-student, student-teacher; and teacher-parent. Through our compass program, students have opportunities to understand what each of the values represent and how they can be demonstrated in their daily lives. Aspire: We aspire to the heights by setting high expectations for ourselves and others. Achieve: We set goals and strive to accomplish them. We reflect and seek support to improve. Connect: We connect with and support others and seek to have a positive impact on our community and world. your child to understand our school values.